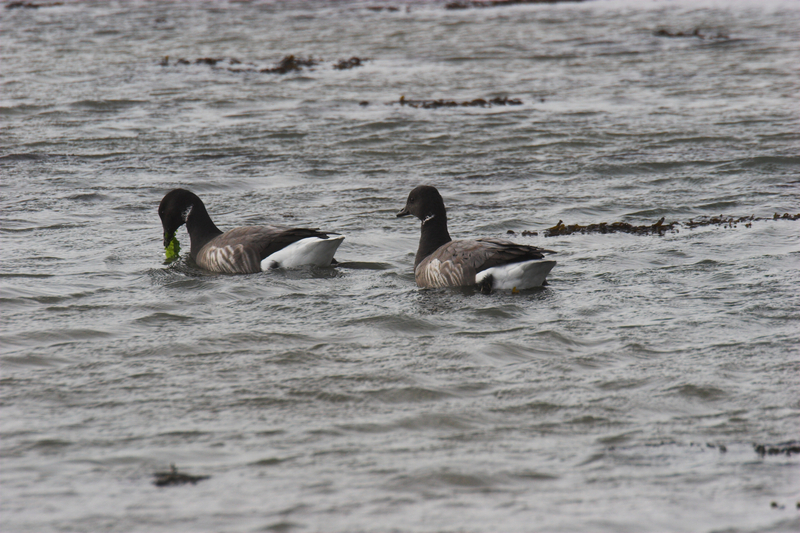 Brent geese must be amongst the best known birds in the Channel Islands. 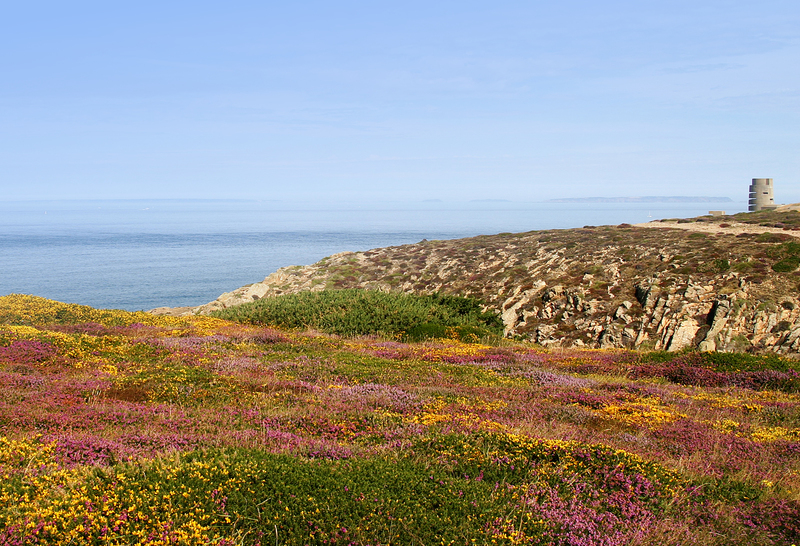 Up to 1,500 may winter in Jersey with smaller numbers in Guernsey, Herm and Alderney each year. The main reason that these geese come to our shores is because there are beds of the highly vulnerable eel-grass, one of the birds’ most important food sources here. However, despite spending around eight months with us, how much do we really know about these little, approachable geese? For one thing, how many Channel Islanders actually know that our islands are almost unique in annually hosting populations of two very distinctly different brent geese? 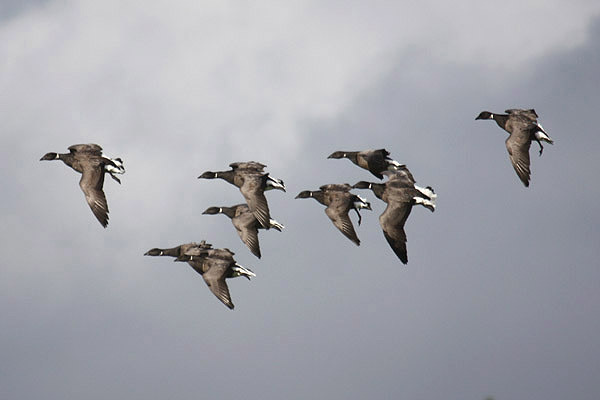 Dark-bellied brent geese (Branta bernicla bernicla) return to us each year in September from the Russian arctic. They breed up in the wilds of the Asian tundra but spend their winter in much tamer environments of British and French beaches, harbours and, at times, farmers’ fields and even golf courses. It is often hard to imagine that the calm little geese we see in winter are the same birds that disperse across a hostile arctic wilderness each spring. 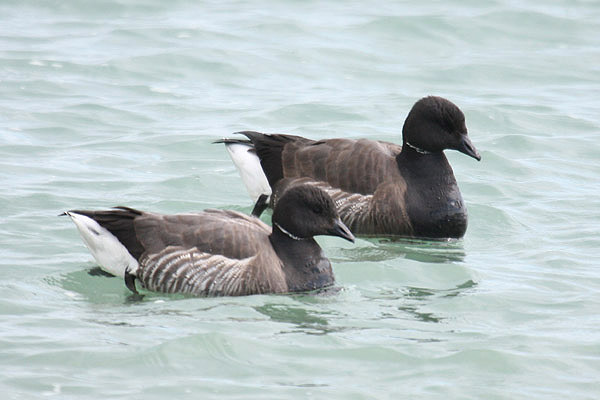 Earlier in the 20th Century, dark-bellied brent geese were quiet rare. The numbers we see now (over 200,000 worldwide) are testament to a successful global conservation campaign. The population began to rise when UK and France banned hunting in 1954 and 1966 respectively. However, things really changed when the flocks migrating through Denmark were given legal protection in 1972. Safe in their breeding grounds, their wintering areas and on their migration stopovers in between, this endearing little goose quickly recovered. In winter, we see these Russian visitors collecting in our quiet bays and beaches or flocking inland on the high tide in a handful of places (most still roost out to sea). Over recent years, many geese have been given coloured plastic rings by researchers that are easy for birdwatchers to see allowing us to keep an eye on the birds’ activities. These ringing studies, some geese have been caught locally, some in the Netherlands and some in the arctic, show us how long the birds might live, how productive their breeding seasons are (did you know their breeding success is linked to the abundance of lemmings?) and, most importantly, how they distribute themselves along our coastline. Perhaps the most important discovery has been that individual geese return to the same bay or stretch of beach each year and don’t visit other bays. This means that loss of one site might mean the total loss of that site’s geese. They won’t just go to another bay. Put simply, they’ll probably die. Pale-bellied brent geese (Branta bernicla hrota), the other brent goose present in the Channel Islands over the winter, arrive rather later, in November each year, and are much less numerous. These, as their name suggests, and as can be seen in the photographs, have much paler bellies than their Russian counterparts. Juvenile upper-wings have a barred appearance when the bird is at rest, compared with the more uniform back of adults. Up to 150 can be observed in Jersey, concentrated in St. Aubin’s Bay (look out for them at West Park or by St Aubin’s Harbour), but only a handful has been recorded in the other islands. 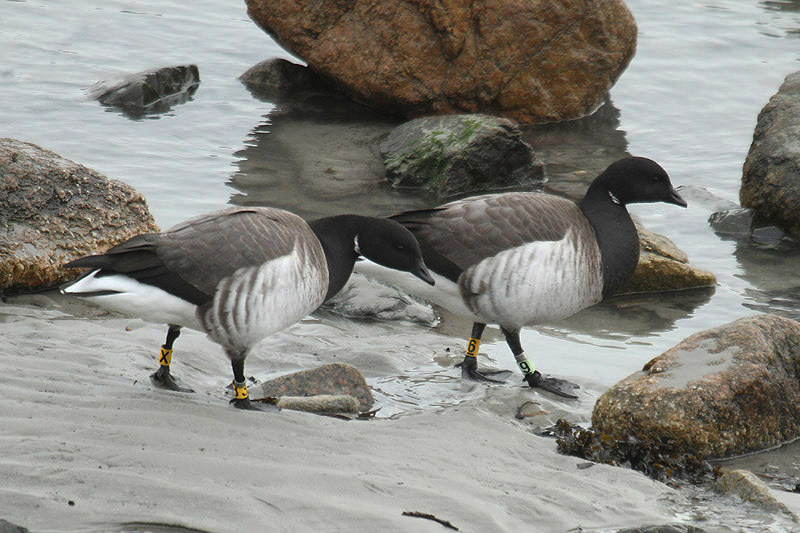 Similar ringing studies to those for the dark-bellied brent geese have shown that there are two distinct flyway populations of pale-bellied brent geese, one which breeds in Svalbard and North-eastern Greenland, the other in arctic Canada. The latter population, to which our birds have been shown to belong, currently numbers around 40,000 birds, and has been subject to intensive study by the Irish Brent Goose Research Group and their Icelandic collaborators. When they arrive in Jersey, the geese have undertaken an amazing annual migration, travelling from the breeding grounds over the Greenland Ice-cap, then staging in western Iceland before an onward flight to Ireland, where an amazing 75% of birds gather initially at a single site, Strangford Lough in Northern Ireland. Peak numbers generally occur there in early October, following which the geese move on, as the eel-grass which attracts them there gets depleted. About 90% of these pale-bellied brent geese will disperse to within the bays all around Ireland for the rest of the winter, but others will travel further, to spend the rest of the winter in Western Britain, Normandy, and here in Jersey. Jersey is, therefore, particularly special as it is near the southern limit of the flyway range, as shown by the re-sighting of marked birds. The resightings of the pale-bellieds further demonstrate just how site-faithful these geese can be. An example is 3XYY (see photo), which was ringed near Reykjavik in Iceland in May 2006 and has appeared at St. Aubin’s Bay every winter since then. Another is PUWR, seen every winter but one since being ringed in west Iceland in May 2010, passing through Jersey en route to Régnéville in Normandy. Both these geese are back this winter. Whilst the numbers of geese in this population have approximately doubled over the past 10-15 years, they can experience low reproduction in years when conditions in the arctic are inclement, as the suitable weather window of time for successful breeding can be very narrow. This was particularly evident after summer 2013, when birds returned to the wintering areas with virtually no young. Birds are highly dispersed whilst breeding, and nests are liable to predation. 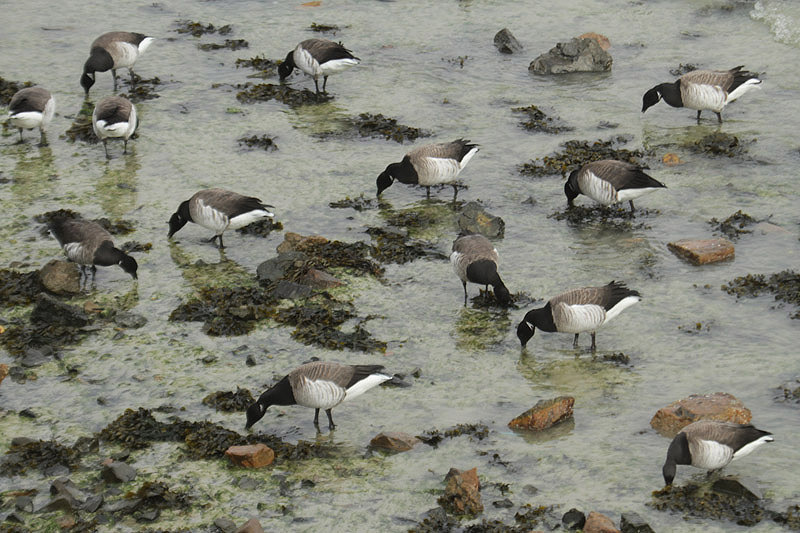 Brent geese tend to congregate, often in very large flocks, during passage and the winter. The fact that such a high proportion of the flyway population gathers together at a single site in autumn also renders the geese potentially significantly vulnerable to a major problem with their main food source there (eel-grass), and to contagious disease. This year again, very few young birds have been seen in Jersey while, in contrast, the dark-bellied birds appear to have had a very good year. So, next time you see a flock of this most maritime species of goose, take a good look and see whether you can spot any of these amazing little pale-bellied brent geese, and marvel. Interestingly, to complete the record, a third brent goose, the black brant (Branta bernicla nigricans) lives in the Pacific. This goose too occasionally, but not annually, visits the Channel Islands usually in the flocks of dark-bellied brent, presumably having joined them in the Russian far east. 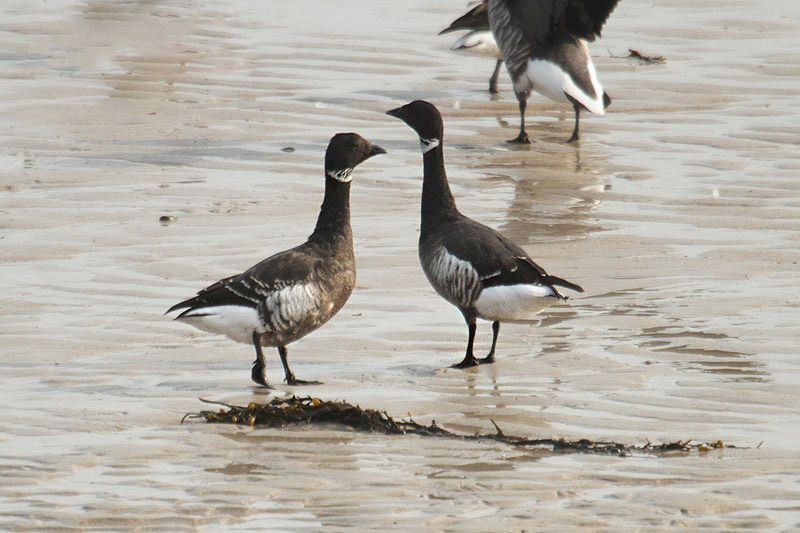 Read Graham McElwaine’s blog on monitoring brent geese from their breeding grounds (watch out for those polar bears), to the winter beaches here.